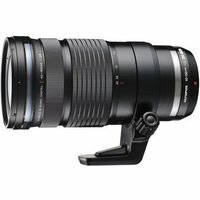 The Olympus 40-150mm f/2.8 PRO M.ZUIKO Digital lens with 1.4x teleconverter attached extends the zoom power of the lens to a 420mm equivalent, without greatly increasing the weight or size. The lens comes with a maximum f/2.8 aperture and a new focusing system which powers 2 high-grade elements using dual linear motors for ultra-quick and near-silent focusing. The lens offers a 70cm minimum focusing distance at all focal lengths and both feature a metal-cased, dust-, splash- and freeze-proof build.